There are all sorts of ways to record video while riding your bike... and here's another. I'm using an iPod nano placed inside of a badge holder (that we all have from trade shows and conferences). I set the nano to video record, and off I go. 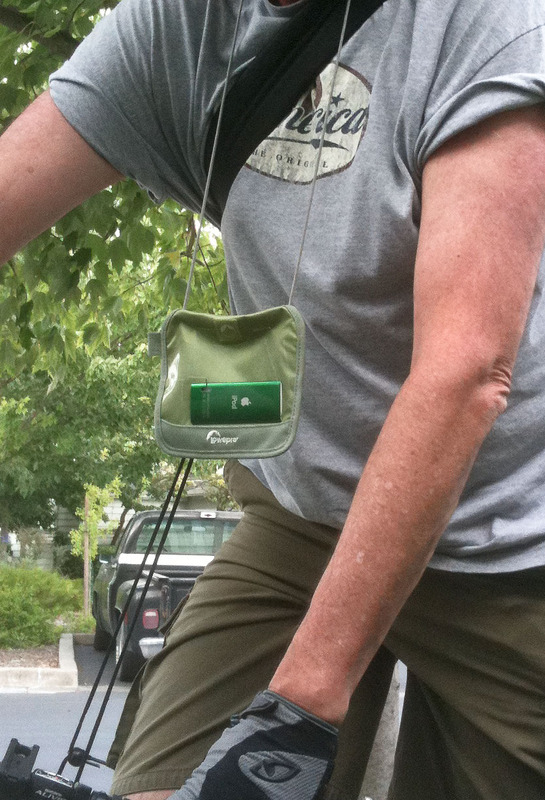 nanocam rig using badge holder to house iPod nano while riding. Click on image for larger version. I cut a square hole in the clear part of the badge holder for the iPod nano camera lens and microphone. I hang the badge holder around my neck, and add a little stability using a cord that is looped around the bike frame. This allows me to record when both hands are on the bike. However, the best recording happens when I can take one hand and steady the badge holder while peddling. It's much easier to grip than the nano itself, plus you don't have to worry about dropping it. The holder also allows me to direct the camera at other angles. If I need to put both hands on the bike, I can while still recording, thanks to the security of the rig. I also found that if I loop my thumb around the stabilizing cord while both hands are on the bike, I can still record decent video. It's definitely a trial and error procedure, though. This is yet another silly contraption for video recording while biking. Since nearly everyone has a conference badge holder laying around, however, this is a method you can rig up in just a few minutes. This is a good example of something simple you can make from items that are on hand. Pretty cool. Here's an alternate method for the badge holder nanocam set up. Instead of securing a stabilizer line to the bike, I let the badge holder just hang around my neck. When I had to shift gears or hold the bike handles with 2 hands, I put the badge holder in my mouth while recording. It worked surprisingly well.